Pre-concert Reception at the Kennedy Center before Saturday’s concert by the National Symphony Orchestra, courtesy of our hosts, SHIFT co-sponsors the Kennedy Center and Washington Performing Arts. 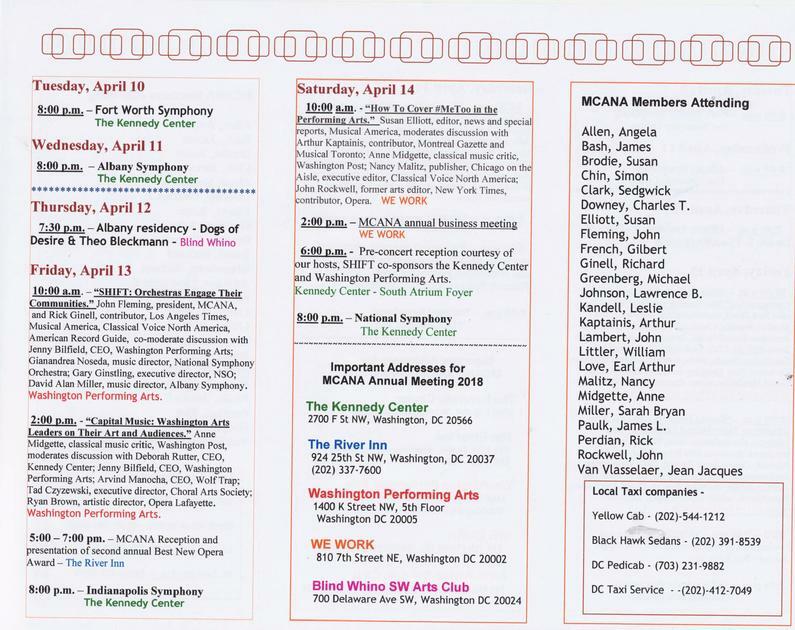 The Music Critics Association of North America board recently voted to hold our 2018 annual meeting in connection with the second annual SHIFT: A Festival of American Orchestras at the John F. Kennedy Center for the Performing Arts in Washington, D.C. The convention’s official dates will be April 12-14, but there are events on either side of those dates that members may want to attend and for which tickets will be available. Details of the annual meeting are to be worked out and will follow. Registration forms have been sent to all current MCANA members. A registration form can also be found at the bottom of this announcement. Registration deadline is March 10th. SHIFT’s four participating orchestras – the Fort Worth Symphony Orchestra, Albany Symphony, Indianapolis Symphony, and National Symphony Orchestra – will, as a press release puts it, “spotlight repertoire influenced and inspired by literature, history, geography, varied cultures, and nature, and will encompass collaborations with vocalists and choirs, dancers, star solo instrumentalist, and six living composers.” For a rough draft of the festival lineup, see the attachment. (This was prepared by SHIFT before the death of baritone Dmitry Hvorostovsky, who was scheduled to perform with the NSO.) Note that the lineup includes a number of time slots for "residency" events. The festival explores the various ways orchestras are re-imagining their roles in their communities, and these events, which take place all over the city, allow each orchestra to show off their own outreach. Most will likely consist of innovative concerts, workshops, and panel discussions, and obviously they'll be available for members who want to attend. Program details will be announced soon. SHIFT is eager to have us at the festival, and Washington is a fine place for a meeting, with good public transit, plenty of hotel choices, and the cherry blossoms out in April.